Ely is a tiny city about 130km from London. 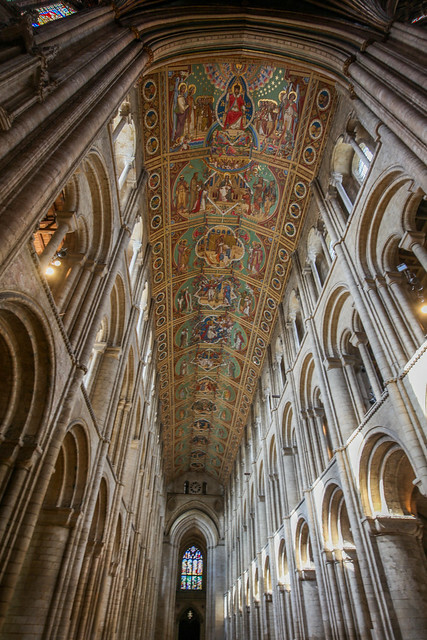 The most notable feature of this city is an enormous cathedral that dates back to Norman times. The city is built on an island in an area known as The Fens. The Fens was previously a marshy wetland, but was drained and made into farmland; initially in Roman times, but mostly in the 17th century. 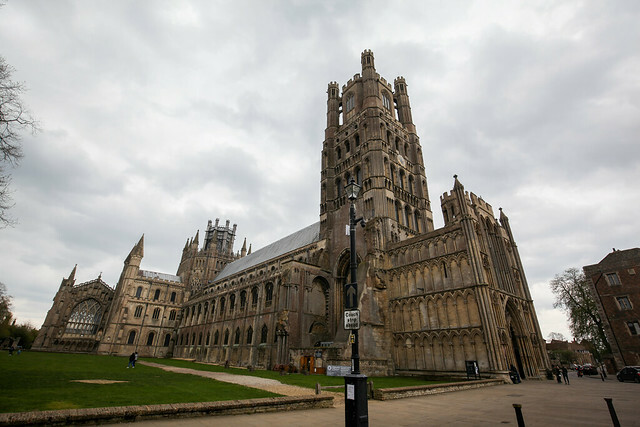 Ely is at the highest point in the Fens, and the cathedral is visible on a clear day from miles away. 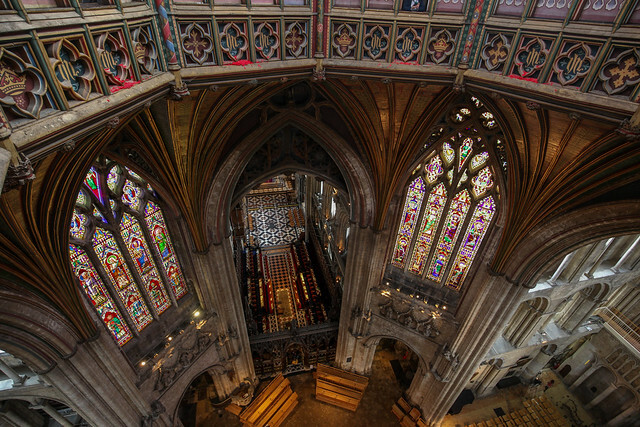 1: View of Ely from the Ely Cathedral lantern. Ely is a small town, it’s amazing such a large cathedral exists here. 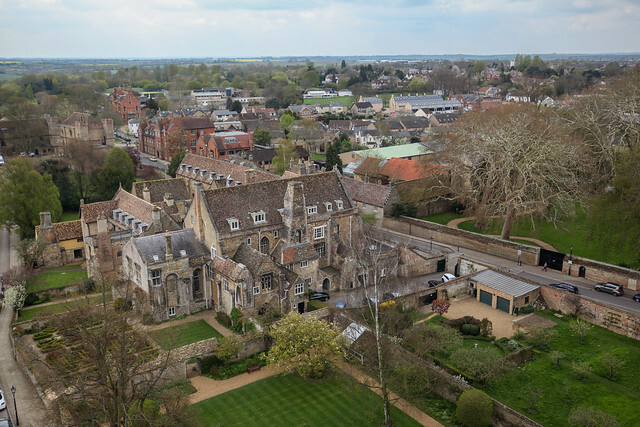 The site was originally an abbey founded in the 7th century by Etheldreda, daughter of king Anna of East Anglia. 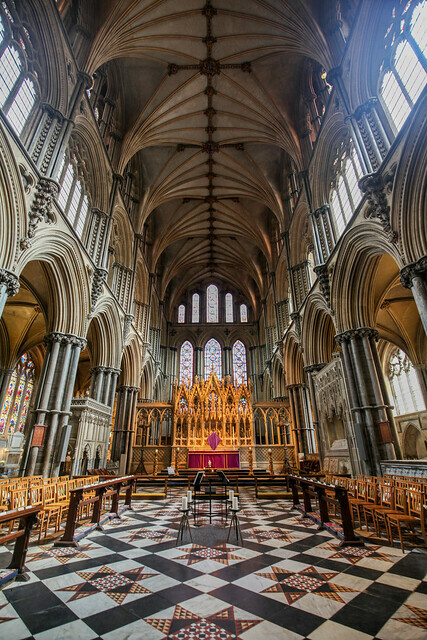 2: A shrine was built here for Etheldreda after she was made a saint, and the site became a major pilgrimage destination during medieval times. Construction the the existing cathedral began in the 11th century. 3: The three-tier Romanesque archways of the nave date back to Norman times. The beautiful panel ceiling was installed during Victorian times. 4: The interior of the lantern. The lantern is built entirely out of wood. 5: Each angel panel is painted with a unique angel playing an instrument. The panels can be swung open and used as a viewing platform as pictured here. 6: Here is a view inside the lantern. You can see the back side of the angel panels. The 8 main columns of the wood are thought to be 1000 year-old oak and over 60 feet long. 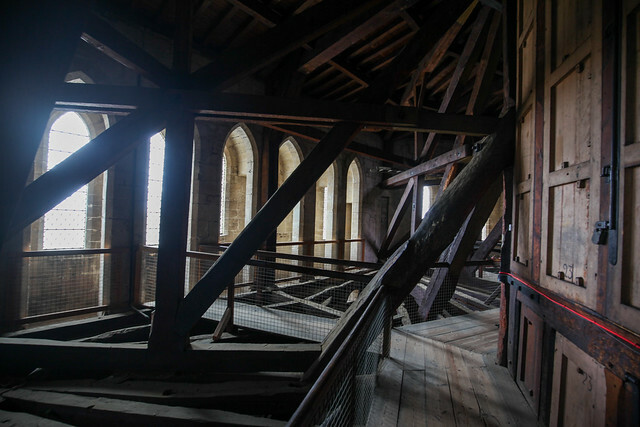 The lantern and complex wooden support structure was built in the early 14th century and is still going strong today. 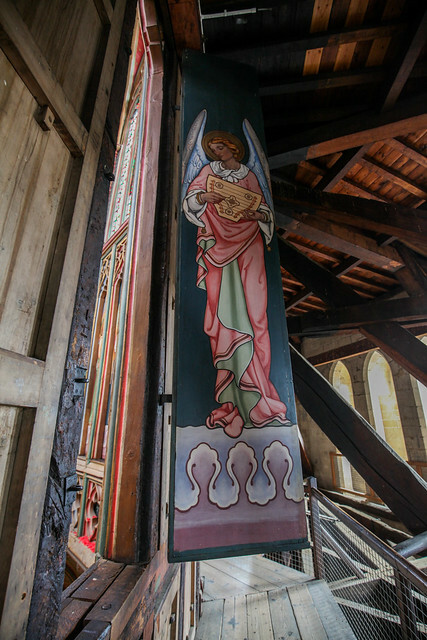 7: You get a bird’s eye view of the octagon below the lantern from each open angel panel. 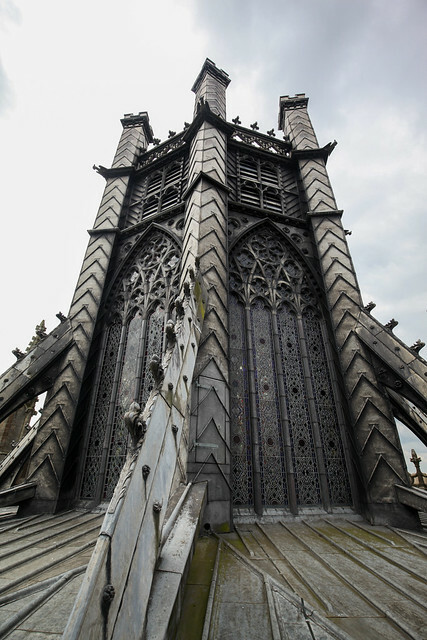 8: The exterior of the lantern, it is coated in tons of lead. 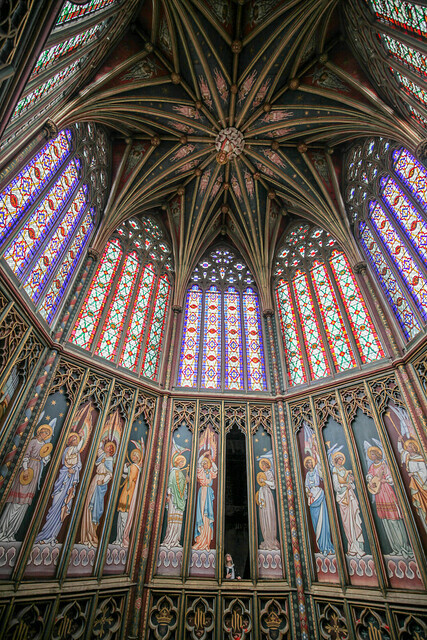 10: The interior of the lady chapel was once colorful and richly decorated with statues and carvings. 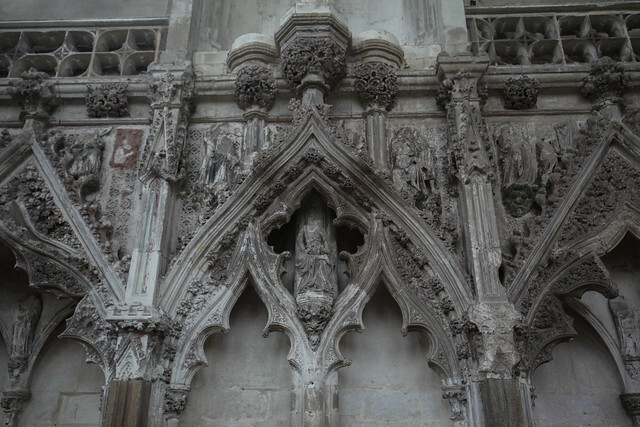 During Henry VIII’s English reformation, these decorations were either removed or defaced. 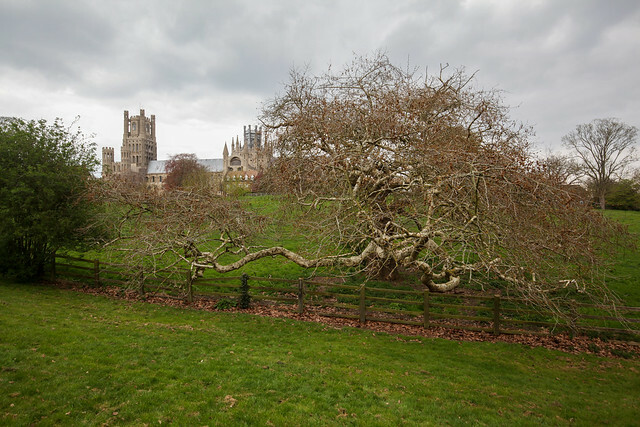 11: I found this magnificent willow tree near the cathedral. 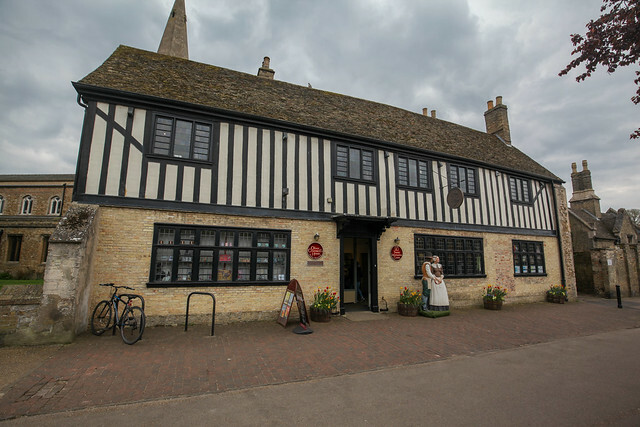 12: This is a house where Oliver Cromwell, Lord Protector of England once resided. He lived here while acting as the tithe collector for Ely Cathedral. Due to his participation in the English Civil War, and execution of King Charles I, he was loved by some, hated by others. He died while in power and had an elaborate funeral. Upon restoration of the monarchy, his body was dug up and executed posthumously.